Recent developments in the case of Steve's missing cookies have been shocking. News was revealed that two Siberians, Sitka and Cornelia Marie, have an established method of tracking all Happy Hearts Cookie shipments and rerouting them to Georgia. This news was met with bewilderment. How can two Siberians hack into the huge shipping system that is FedEx? The answer came when another Siberian Husky, Echo, came forward with an accusation. Echo stated, "I can't believe [Steve and Happy Hearts Inc have] been duped by the squirrels' evil plot." Echo's accusation seemed impossible. Sitka and Cornelia Marie seem like unlikely partners in a squirrels' plot. An anonymous tip arrived with this picture. 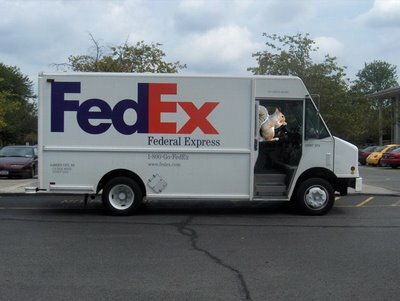 Now photographic evidence links squirrels to FedEx trucks. Will evidence surface linking Sitka and Cornelia Marie to the squirrels? Stay tuned to this news channel for up to the minute reporting on this case.